Published by Screenovate Technologies LTD. This app requires the companion Alienware Mobile Connect PC app available, for free, through the Microsoft App Store. The companion PC app is available on Alienware PCs purchased starting in January 2018. Alienware PCs purchased before January 2018 are not supported to ensure the highest level of quality you expect from Alienware. We are investigating expansion to Alienware PCs purchased before January 2018. Alienware Mobile Connect creates an advanced, complete, and wireless integration between your PC and smartphone. Enjoy your smartphone’s full functionality through your Alienware PC’s mouse, keyboard, and touch screen. 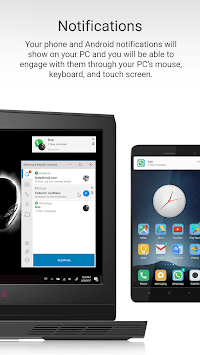 Make or take calls, send and receive text messages, access your contacts, get mobile app notifications, wirelessly drag and drop files and mirror your phone’s screen onto your PC for interactive engagement with any of your mobile apps. • Text messaging – Send and receive text messages using your PC’s keyboard, mouse, and touch-screen. • Phone calls – Initiate and receive phone calls through your PC’s speakers and microphone. • Contacts – Access your phone’s complete contact book through your PC. 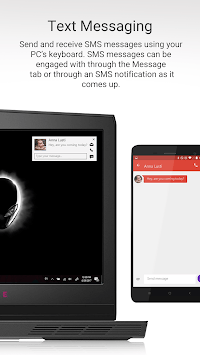 • Notifications – Your phone's native and 3rd party notifications will appear on your PC. • Screen mirroring – Mirror your phone’s screen onto your PC and engage with any of the apps using your PC’s keyboard, mouse, and touch-screen. • File Transfer – Wirelessly drag and drop photos, videos, music, and documents between your PC and smartphone. 1. Install the Microsoft Store app on your compatible Alienware PC, if it’s not already factory installed. 2. Download the companion app here. 3. 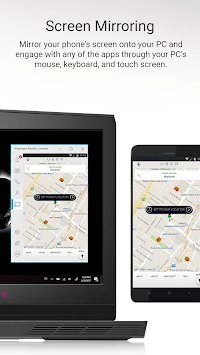 Launch the Alienware Mobile Connect PC app and follow the quick, guided, one-time set-up to wirelessly connect your phone. • PC: Alienware PCs purchased starting in January 2018. • Mobile: Android 6 and above.